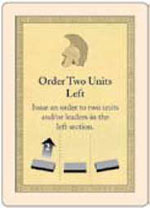 Section cards are used to order units and/or leaders in a specific section of the battlefield to move and/or battle. These cards indicate in which section of the battlefield you may order units or leaders and how many units or leaders you may order. All Section Command cards have a leader helmet symbol on the card, to remind players that one or more attached leaders in the section may be ordered to detach and move separately (for the cost of one order each) when the card is played. Troop cards allow you to order a specific unit type (Example: light, medium) to move and/or battle. Unless the card states otherwise, you may freely choose Foot or Mounted units... So "Order Light" means you can issue your allotment of orders to any combination of light Foot units or light Mounted units. Or- dered units may be in any section of the battlefield. The number of units you may order is equal to your side's Command, i.e. the maximum number of cards you may hold in your hand on that turn. Light unit types: Light infantry, light bow infantry, light sling infantry, auxilia, light cavalry, light bow cavalry and barbarian chariot. Medium unit types: Medium infantry, warrior, medium cavalry, camel and cataphracted camel. Heavy unit types: Heavy infantry, heavy war machines, heavy cavalry, heavy cataphracted cavalry, heavy chariot and elephant. Mounted unit types: Light cavalry, light bow cavalry, barbarian chariot, medium cavalry, camel, cataphracted camel, heavy cavalry, heavy cataphracted cavalry, heavy chariot and elephant. Leadership cards allow you to order a leader, any unit to which the leader is attached, plus a given number of units or leaders in adjacent linked hexes to move and/or battle. Units in "adjacent linked hexes" may be in different sections of the battlefield, as long as each ordered unit is adjacent to at least one other ordered unit, and at least one of the ordered units is adjacent to the designated leader. In this way, a Leadership order enables you to order a "chain" or "wing" of units to move and/or battle in a coordinated fashion. A leader may not detach on a Leader- ship Command card. The two examples above show two possible ways a leader- ship card can be used to activate a leader's hex plus four adjacent linked hexes. Tactic cards allow ordered units to move and/or battle in ways not allowed in the basic rules. Actions ordered on Tactic cards take precedence over basic rules. Command cards that state 'order units equal to command' means the maximum number of units you may order is equal to your side's Command (see 7: Order Units and Leaders). Note: on Tactic Command cards, Ranged Combat is sometimes referred to as Fire. 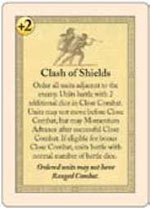 Clash of Shields: Order all units adjacent to the enemy. Units battle with 2 additional dice in Close Combat. Note: All units adjacent to an enemy unit when this card is played are ordered. This can get a little confusing, especially as combats take place and enemy units are forced to retreat. We suggest that you mark the units eligible to battle before you start your Close Combats. 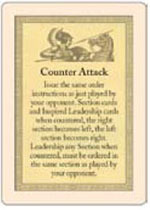 Counter Attack: Issue the same order that your opponent just played. When countering Section cards and Inspired Leadership cards, the right section becomes left, the left section becomes right. When countering Leadership Any Section, your orders must be in the same section your opponent chose. (2 cards). Note: You cannot use Counter Attack on a First Strike card. Note: This means all ranged weapons units are considered "ordered". While a unit cannot range fire if adjacent an enemy unit, if that changes during battling (perhaps because of fire from some other unit that eliminates or forces the adjacent unit to retreat), then the newly released unit is still ordered and may range fire. Double Time: Order 4 or fewer foot units in a group (units in adjacent linked hexes that may span two sections). Each ordered unit (except war machines) may move two hexes and still engage in Close Combat. Note: Light foot units do not gain any movement advantage when part of a Double Time order. 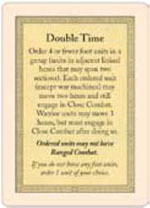 The Double Time card symbolizes the final rush into Close Combat. Light foot units generally preferred to avoid Close Combat so they don't have a move advantage. However, auxilia foot units gain a battle advantage when part of a Double Time order, as they can move 2 and still Close Combat. Note: Regardless of the outcome of your First Strike, your unit is not eligible to Battle Back. Note: Before drawing a new card, reshuffle the deck with the discards, including this card, to form a new draw deck. Cards in the player's hands are not reshuffled. 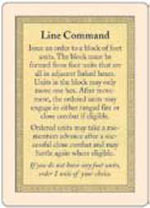 Line Command: Order a group of foot units. The group must be in adjacent linked hexes (which may span two or three sections). Each unit may move no more than one hex and then engage in Ranged Fire or Close Combat if eligible. Note: Ordered units do not have to move to engage in combat. 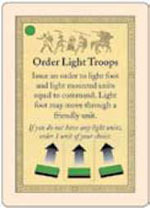 Move-Fire-Move: Order light foot and light mounted units equal to Command. Units may move, fire and move again. All units moving first must do so before any fire. After all Ranged Combat, units may move again. Play note: The three orders on this card are all optional-the first move, the fire (Ranged Combat), and the second move. The key here is that the all ordered units must complete their first move before there is any Ranged Combat. After all Ranged Combat is completed, ordered units may make a second move. Note: Heavy units that may move three hexes when given an order to charge include heavy cavalry, heavy cataphracted cav- alry, elephants, and heavy chariots. 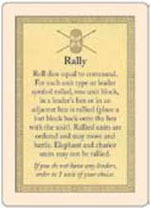 Rally: Roll dice equal to Command. For each unit type or leader symbol rolled, one unit of the appropriate type in or adjacent to a leader's hex is rallied (replace a block in the under strength unit). Note: Units may not gain more blocks than they had to begin with, but units may regain more than one block if they have lost more than one. Leader symbols can be used to rally any type of eligible unit. A unit already at full strength with or adjacent to a leader can never be rallied, regardless of the die roll. There- fore only units which actually "regain" a block are considered ordered when rallied. All leaders on the battlefield may be used to rally under strength units. A leader is attached to a medium infantry unit with two blocks. He is adjacent to a friendly light unit and elephant unit that have each lost a block. The rally dice are rolled, and the results yield two leader helmets and two heavy unit red squares. Each helmet result can be used to replace one lost block of any eligible unit type. The player chooses to replace both lost blocks in the medium infantry unit and none in the light unit. The medium infantry unit is rallied and may be ordered to move and battle, but the light unit is not rallied and may not be ordered. The elephant unit cannot be rallied. Luckily, the player has another leader that is adjacent to two heavy units that have each lost two blocks. The player applies one red square result to each adjacent heavy infantry unit, replacing one lost block in each unit. Both heavy infantry units are rallied and may be ordered to move and battle. The player had the option of applying both red square results to only one heavy infantry unit; however, wanting to order both units, he restored just one block to each.